Raw meat. 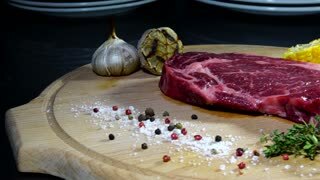 A large piece of beef chop on a cutting board with rosemary and spices. Chefs hands prepares sandwich with smoked chicken breast and tomatoes on a cutting board. Chef in disposable gloves cuts smoked chicken brisket into pieces with a kitchen knife on a cutting board. Slow motion of barbecue meat being flame grilled. Fire shoots out of a flame thrower over sizzling beef brisket. Action shot would be perfect for videos on summertime grilling competitions and the un-sustainable practices of the meat industry. Man pulls flame grilled beef off a barbecue grill. 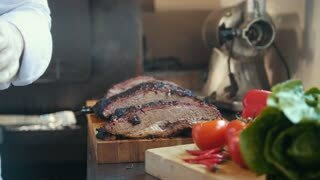 Tracking shot of using bbq tongs to let the delicious smoked meat rest before serving it at a summer picnic. Action shot would be perfect for videos on summertime grilling competitions. Using a flame thrower to sear a side of beef in slow motion. The bright orange flames sizzle over the large piece of smoked meat. Closeup of the action would be perfect for videos on summertime grilling competitions. 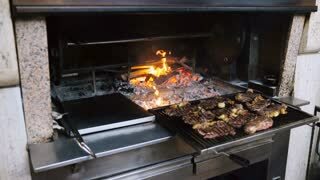 Flame grilling beef on a barbecue grill in slow motion. Fire shoots out of a flame thrower over sizzling smoked meats. Action shot would be perfect for videos on summertime grilling competitions and the un-sustainable practices of the meat industry. Torching BBQ beef brisket with a propane torch in slow motion. Flames shoot over the smoked meat grilling the flesh. Closeup of the grilled meat would be perfect for videos on competition barbecuing, summertime picnics, and cooking instructions. Flame grilling barbecue beef brisket in slow motion. Flames shoot from a propane torch, searing the smoked meat. Closeup of the grilled meat would be perfect for videos on competition barbecuing, summertime picnics, and cooking instructions. 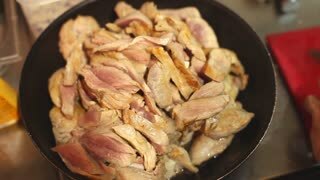 Man fry minced meat and pieces of bacon in a pan on electric stove. Bruschetta with cottage cheese, tomatoes and arugula served on white creamic tray. A steaks of meat is cooking on a grill. Cooking beef steak in the interior of modern professional kitchen. Meat near fire flame. 4K. Professional chef cooking delicious steaks on grill at restaurant kitchen. 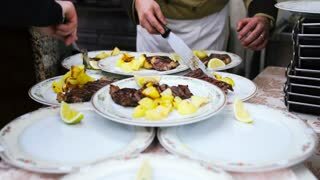 Juicy steaks with blood on the plates. Eat in restaurant. 4K. Packaged beef at a grocery store. Close up on hands holding a smoked brisket on a cutting board, quickly slicing cooked meat. 4K Video. CLOSE UP: Fresh, lean, Red Chadolbaegi (????) thin beef brisket slices beginning to cook at a Korean barbque restaurant. The foorage is 60fps and can be use for SLOW MOTION. SLOW MOTION: Fresh, lean, Chadolbaegi (????) thin beef brisket slices arriving to the table at a Korean barbque restaurant. space is cleared for them amongst side-dishes and the hot plate. Fresh, lean, Chadolbaegi (????) thin beef brisket slices cooking at a Korean barbque restaurant. They are sizzing away and turning brown whilst oozing with fatty juices.